Growing up, my parents' family house in the South of France had a small fruit and vegetable patch where I would escape to in the summer to pick and taste that summer's berries. A couple days ago I rediscovered the pleasure of berry picking by visiting a little farm outside of Montreal. Seeing the farmers work the land brings up an array of questions surrounding what we choose to put on our tables everyday. I always catch myself when I'm at the butcher's looking at the neatly packed meat and pushing away the thought that the meat was once part of a living animal. In an effort to better understand where our food comes from, I've made the necessary effort to confront the facts about the origins of our food. 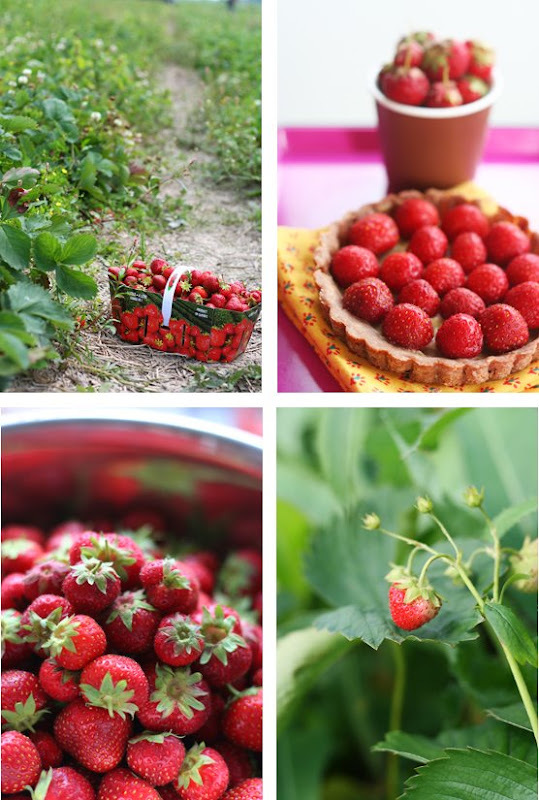 Even piking strawberries for a couple hours in the afternoon, in the middle of a farmed field, gets you thinking about the journey from the farm to the table.. and isn't it always better when that trip is as close as can be? Picking your own vegetables or fruit from a trusted farm also gets you thinking about what we've been fed (pun intended!) to think about food. Tomatoes in the supermarket are generally perfectly round, uniformly red and as shiny as can be. Sure, this may fit our idea of what healthy, nutritious produce should look like, but it's really not how nature intended it. Fruit and vegetables should not be perfect, they should have little bumps and imperfections and come in different shapes and sizes. I had fun picking out all the different kinds of strawberries I could find. The strawberries I used for the tart were all very petite (about the size of raspberries) which worked out well for individual tartelettes. I am planning on making a mixed berry granita with the rest.. although I must admit that at the rate we've been munching on them, I'm not sure I will be able to do so! See here for my tart dough recipe (I added a tablespoon of cocoa powder to my paste sucree recipe this time), and my pastry cream recipe. At cooking school, we used to finish off all fruit tarts by glazing them with an apricot glaze. You can do the same at home by melting down apricot jam in a small saucepan with a couple tablespoons of water, and gently brushing the mixture on top of the fruit. Enjoy! What a lovely color the cocoa powder gave your pastry. Your collage is beautiful and a space saver as well. SO where did you end up going, there are a couple other places I have been wondering about! Looks like you got a great bountiful. I just finished reading "in defence of food" and am in the middle of "Animal, vegetable, miracle". All I can think about these days are the farmers markets and buying locally. Sounds like we share the same view on that. Justin: I'm actually heading to the house in August.It's really a food lover's paradise! I absolutely love picking produce. It's the gatherer in me!!! These tarts look perfect and the photos are very very very pretty! Gorgeous pictures! Makes me wish my little strawberry plant still had some strawberries on it! Wow! I love that berry-picking basket too. It's adorable. I love picking out all the weird shaped berries when I go picking! I like the idea of the cocoa powder in your pastry. Thanks for stopping by my kitchen. It gave me the opportunity to see your lovely blog. How wonderful that your family had a home in the south of France. Where? We visited St. Remy de Provence a couple of years ago for two months. J'adore anything French. My Carolina Kitchen: I grew up in Paris, but my parents have a family home in the South Region of the Pyrenees. It's a beautiful region! if only i could pick my own berries! jealousjealous too! I don't get over here nearly often enough - this recipe is a keeper! Thanks for stopping by my blog and for your kind comments! what adorable little strawberries! Nice to see normal sized ones rather than these gargantuan specimens in the supermarkets. I just found your site and it is beeeaaauuutifuuulll. Will keep checking in. I would love to be at your table, having a slice of that amazing tart. I grew up in Oregon and every summer we would go to the u-pick farms. The "Hood" variety is an delicous strawberry from the Northwest. I must try one more strawberry tart; I want a choco base this time.